The Asian electric two-wheeler market is predicted to grow at 7.0% CAGR during the forecast period with its fleet size reaching 59.3 million units by 2024. 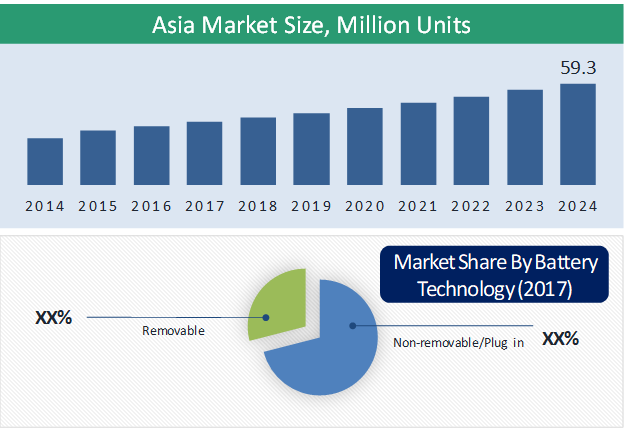 The Asian market is primarily driven by the technological advancements in battery technology, government support and initiatives for electric vehicles, increasing awareness for curbing vehicular emissions. Different products including e-scooters and e-bikes are majorly contributing to the electric two-wheeler market size in Asia. 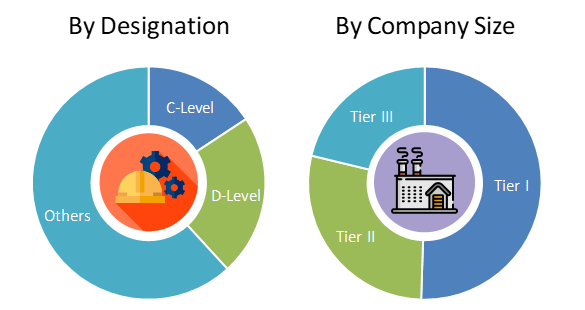 The market has witnessed significant demand for these products over the last few years with the increasing disposable income and rapid urbanization. Based on product, the market is categorized into e-scooters, e-bikes, e-motorcycles and others. E-scooters held the largest share of more than 55% in the Asian electric two-wheeler market in 2017, in terms of fleet size. Increasing popularity of electric scooters among younger generation especially working professionals and students leads to the largest share of the category. On the basis of battery type, the market is segmented into sealed lead acid, Li-ion, and NiMH. Of all, sealed lead acid is the most common type of battery used in the electric two-wheelers in Asia. The highest share of the sealed lead acid battery in the market is due to the lower prices and high output of these batteries. Based on voltage, the market is segmented into 24V, 36V, 48V, 60V, 72V. Of all, 48V electric two-wheeler hold the largest share in the Asian electric two-wheeler market, followed by 36V two-wheelers. Most of the e-rickshaws and e scooters are being developed with a battery of 48V thus leading to the largest share of the category. The technological advancements in battery technology, government support and initiatives for electric vehicles, increasing awareness for curbing vehicular emissions Technological advancements in electric vehicle industry have made electric two-wheelers affordable and increased their performance and efficiency. The major reason for the affordable prices of electric scooters and bikes is the advancement in battery technology. The decline in electric vehicle battery cost has an overall impact on the cost of an electric vehicle. OEMs are investing capital in research and development to further increase the efficiency of the electric battery along with the reducing their cost. Most of the light electric vehicles run on lithium-ion batteries, for which manufacturers are researching to increase its charging capacity. However, the cost of battery, lack of adequate charging infrastructure and competition from gasoline-driven two-wheelers are the key factors hindering the growth of the Asian electric two-wheelers market. Market players in the Asian electric two-wheeler industry are investing huge capital for battery technology, motor technology, and capacity expansion in order to cater to rising demand. In July 2017, Hitachi Automotive Systems, Ltd. And Honda Motor Co. Ltd. Announced the establishment of a joint venture company for the development, manufacture, and sales of motors for electric vehicles on the premises of Hitachi Automotive Systems in Hitachinaka-shi, Ibaraki Prefecture. Hitachi has a 51 percent investment in the venture where Honda has a 49 percent investment in the venture. Hero Electric Vehicles Pvt. Ltd., Yadea Technology Group, Jiangsu Kingbon Vehicle Co., Ltd, AIMA Technology Group Co. Ltd, Zhejiang Luyuan Electric Vehicle Co., Ltd., Jiangsu Xinri E-Vehicle Co., Ltd. (SUNRA), Ather Energy, Spero Electric, Honda Motor Co. Ltd., Terra Motors Corporation, Unistar Co. Ltd., Segway Inc., UDA Motor Co. Ltd, Ningbo MYWAY Intelligent Technology Co. Ltd, Viar Motor Indonesia, Zero Motorcycles Inc., Xiaomi Inc., and Lohia Auto Industries are some of the key players operating in the Asian electric two-wheelers market. 13.1. Hero Electric Vehicles Pvt. Ltd.
13.5. Zhejiang Luyuan Electric Vehicle Co., Ltd.
13.9. Honda Motor Co. Ltd.
13.13. UDA Motor Co. Ltd.
13.14. Ningbo MYWAY Intelligent Technology Co. Ltd.
Table 132 Snapshot – Hero Electric Vehicles Pvt. Ltd.
Table 136 Snapshot – Zhejiang Luyuan Electric Vehicle Co., Ltd.
Table 140 Snapshot – Honda Motor Co. Ltd.
Table 142 Snapshot – Unistar Co. Ltd.
Table 142 Snapshot – Segway Inc.
Table 142 Snapshot – UDA Motor Co. Ltd.
Table 142 Snapshot – Ningbo MYWAY Intelligent Technology Co. Ltd.
Table 142 Snapshot – Xiaomi Inc.
Ningbo MYWAY Intelligent Technology Co. Ltd.